I’ve been busy in the kitchen making some tasty veggie treats for my salads. I eat a huge salad for lunch and dinner almost every day and the more crunch and zingy-zangy flavor the better. Lately, I’ve had a bit of tummy trouble, always when I eat dairy (which I cut out 99% of the time) but lately when I eat grains, beans or bread too–even high quality grains, sprouted breads and the like. A big bummer, because we are a big bread, bean and grain loving family. It sorta comes with being vegetarian. The problem started a bit after turning 40, along with increased difficulty keeping unwanted weight off. Oh, how I remember the days of losing unwanted weight in a matter of days….then days turned into weeks, then weeks into cemented-down-not-going-anywhere-pounds. Oy!! So, I started researching bloated tummy problems, which lead me to learning about food combining, probiotics and enzymes. I’m not a huge fan of buying the pill form of any vitamin or supplement, but I do take Vitamin D and Vitamin B-12. 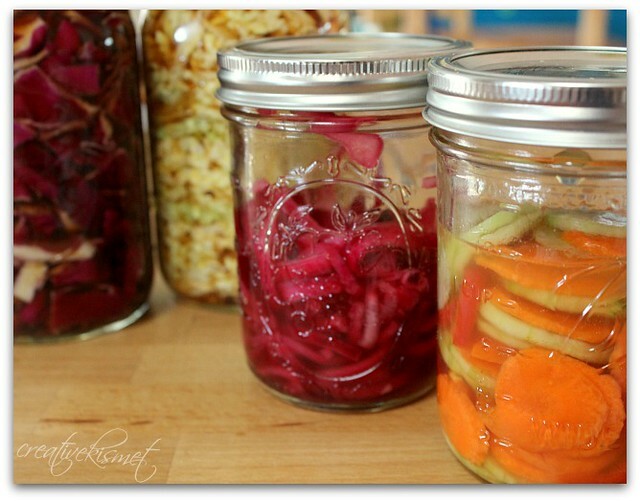 I try my hardest to get what I need through fresh fruits and veggies, which is why I decided to try making my own probiotics and enzymes in the way of raw sauerkraut and other fermented foods. I did buy some probiotics and enzymes in pill form, to see if they would help, and I think they are. 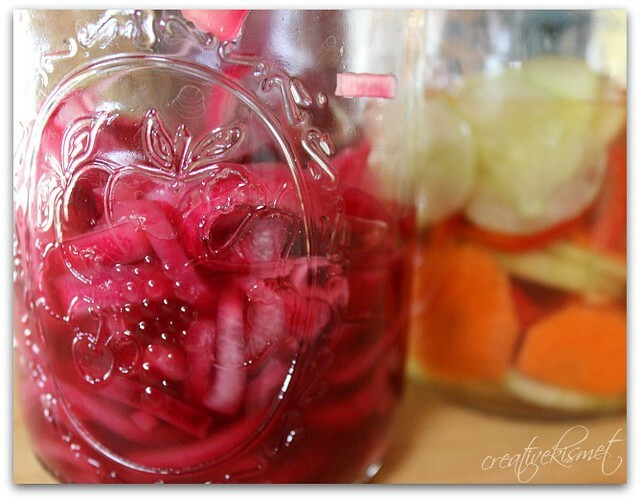 I’ve been making pickled veggies and onions for a while. They are so good in salads, sandwiches, tacos, etc. 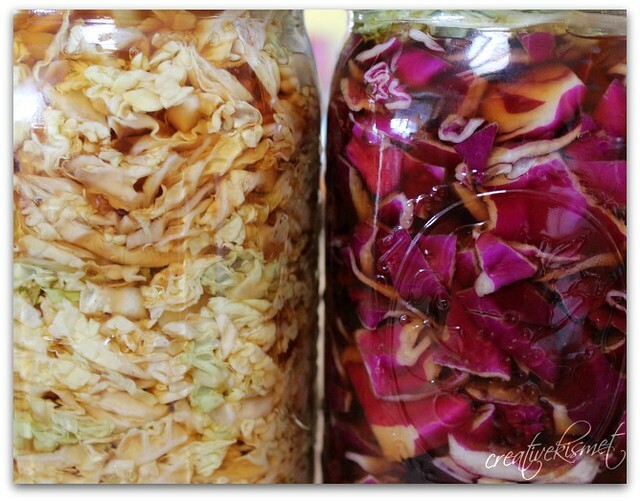 The raw sauerkraut, and fermentation in general, is new to me. It’s been a big learning experience and a bit of work, but totally worth it. And, by changing the order and combination in which I eat my food, plus adding the extra probiotics and enzymes, it has helped my tummy tremendously and I’ve lost a few pounds too (almost 12!!). Instead of trying to explain it all myself, I will share my favorite links and videos for you to check out, if you’re interested. One thing I will say, the process of making raw sauerkraut is a bit messy. 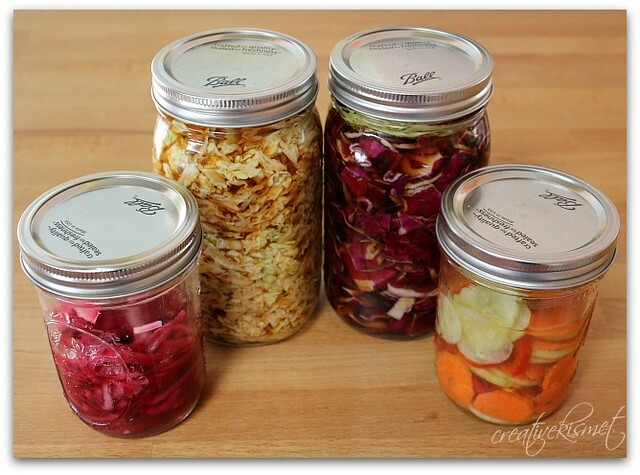 Put your jars in a tray or bowl to help with any leaking from the jar if you try the Probiotic & Enzyme Salad method, which is what I did. Regina please google WHEATBELLY and also check out the author’s youtube videos!!! I’ve been reading the Beauty Detox Diet which discusses many food combining principles. It has a strong pro-plant based diet and raw food thread, but has many options and little steps to take that help with digestion. I also started looking for more info on the subject after reading this post on Mind Body Green. I am sure there is a ton more on the subject.